TEDxNMU tickets will be available Friday, February 1 at 8 a.m. Visit tedxnmu.com/tickets for more information about securing your spot at TEDxNMU. TEDxNMU 2019 will be bigger and better than ever. Last year, you spoke and we listened. We are offering 5x more tickets than 2018 and encourage community members, faculty, staff, alumni, and students to attend this year’s event. This year’s theme is “Diving Deeper”. 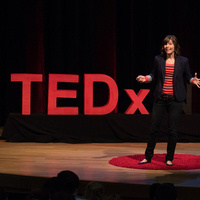 Speakers at TEDxNMU have found their passion in life, and have dove headfirst into it, whether it’s a job, hobby, or interest. Speakers have traveled across the world, changed the course of their education, and started their own businesses. They’ve reflected on their journey, and are ready to take the stage on March 16, 2019, to share their insight with the world. They have followed what made their heart sing, and they hope to inspire those in the audience at TEDxNMU to do the same. We’ve asked a handful of speakers to share their own stories, and we ask that you come prepared on March 16 to hear new ideas, interact with people from all walks of life, and challenge yourself to find out how you can dive deeper into your passions. As speakers will share from the stage, once you dive deeper, your life will change for the better.